Vivian Was Here: Best Birthday Cake! Wow, this was quite the weekend... I'll spare you all the details but you should know I'm still scraping the booze off the floor! The occasion for the festivities was that my man turned 30 on Saturday, which we celebrated with enough alcohol to inebriate an elephant. It all started quite innocent though, with some Bloody Mary's in the morning. But we all know that a Bloody Mary is a gateway drink, and it was no different this time! 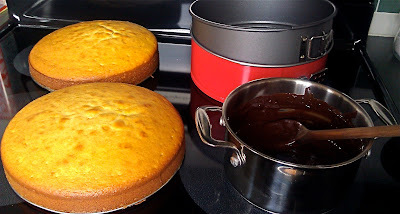 Anyway, as I am trying to be a good wife, my main goal was to to bake him a cake. From scratch. I know me and my big mouth have been blabbing about wanting to bake more, but this is actually the first time I ever made a cake without any help from supermarket bake mixes. It turned out to be easier than I thought, with the delicious recipe from Smitten Kitchen that I pretty much followed. In order to customize this cake, I added fresh strawberries to fill the cake, and decorate the top. It was so delicious to have those sweet and moist strawberries as a flavor and texture surprise on the inside that I suggest you do the same. Just add a big box of 'em to the ingredients below, and go crazy with them! 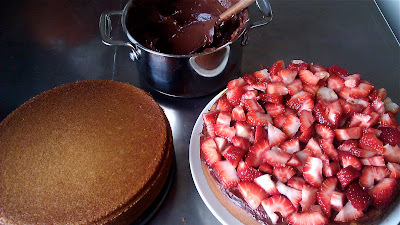 I took the two cakes and covered the top of one of them in frosting, which I then covered with fresh strawberries (I took the green stuff off the strawberries, washed them, cut them, and then lightly dusted them with sugar. The sugar will soak into the strawberries, making them nice and sweet). 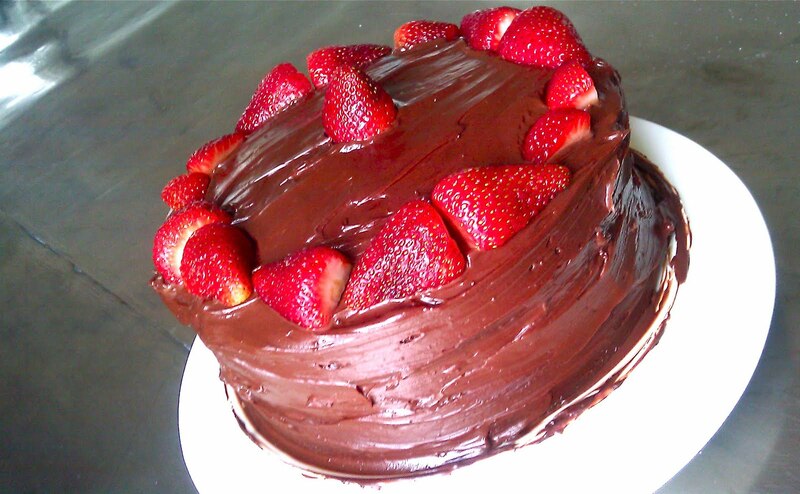 The rest is easy... Just put the other cake on top, slather the whole thing with an abundance of frosting, and decorate with the rest of your fresh strawberries. Needless to say, it was delicious. I can't wait to make this again, as it was definitely a big hit and it earned me lots of smooches from the birthday boy!